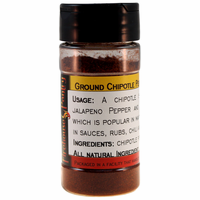 Chipotle chiles are smoke-dried red jalapeno peppers and have a fruity and smoky flavor which is popular in many Southwestern dishes. As the jalapenos are ripe (versus green) the pepper powder is a bit sweet. Use in sauces, rubs, chili, and stews. We like to add it to taco meat. Sprinkle a little chipotle over cooked squash. Ingredients: 100% chipotle pepper. Irradiated to treat bacteria; do not treat again. Packaged in a facility that also packages wheat, milk, soy, egg, peanuts, and tree nuts. Volume: 1 pound = approx. 3.03 cups. 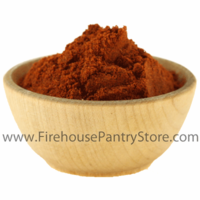 We use this in our Chipotle Ranch Dip & Dressing Mix, Southwest Chipotle Dip Mix, and in Mike's BBQ Rub.